Deep learning using convolutional neural networks (ConvNets) achieves high accuracy across many computer vision tasks, with the ability to learn multi-scale features and generalize across a variety of input data. 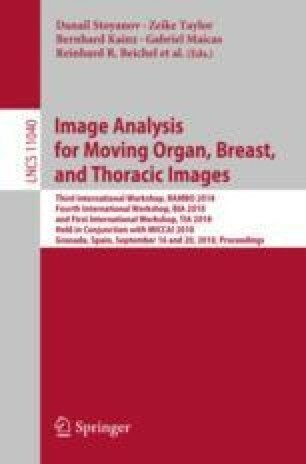 In this work, we propose a deep learning framework that utilizes a coarse-to-fine cascade of 3D ConvNet models for segmentation of lung structures obtained from computed tomographic (CT) images. Deep learning requires a large number of training datasets, which may be challenging in medical imaging, especially for rare diseases. In the present study, transfer learning is utilized for lung segmentation of CT scans in large animal models of the acute respiratory distress syndrome (ARDS) using only 13 subjects. The method was quantitatively evaluated on a human dataset, consisting of 395 3D CT scans from 153 subjects, and an animal dataset consisting of 148 3D CT images from 5 porcine subjects. The human dataset achieved an average Jacaard index of 0.99, and an average symmetric surface distance (ASSD) of 0.29 mm. The animal dataset had an average Jacaard index of 0.94, and an ASSD of 0.99 mm. This work was supported in part by NIH grant CA166703 (J. M. Reinhardt and S. E. Gerard), the National Heart, Lung, and Blood Institute Grants R01-HL-112986, and R01-HL-126838 (D. W. Kaczka), the University of Iowa, Department of Anesthesia (D. W. Kaczka and J. Herrmann), and by the Office of the Assistant Secretary of Defense for Health Affairs through the Peer Reviewed Medical Research Program under Award no. W81XWH-16-1-0434 (D. W. Kaczka). S.E. Gerard received support from a Presidential Fellowship through the University of Iowa Graduate College and from a NASA Iowa Space Grant Consortium Fellowship. The authors thank Dr. Eric Hoffman and Dr. Junfeng Guo from the University of Iowa for providing the CT image data and ground truth segmentations for the IPF cases. Disclosure: Opinions, interpretations, conclusions, and recommendations are those of the authors and are not necessarily endorsed by the U.S. Department of Defense. J. M. Reinhardt is a shareholder in VIDA Diagnostics, Inc.